Glasgow Film Festival: Hail, Caesar! Bringing the big stars and bright lights to this year’s Glasgow Film Festival opening gala is the Coen brothers’ latest work Hail, Caesar! Released earlier this month in the U.S. and set to make its UK premiere at the GFT tomorrow, the film boasts an all-star cast, including Josh Brolin, George Clooney, Channing Tatum, Scarlett Johansson and Ralph Fiennes. Billing as the seventh feature length production written and directed by both brothers Ethan and Joel, the film portrays the ‘golden age’ of 1950s Hollywood through the arduous affairs of movie boss and ‘fixer’ Eddie Mannix (Brolin). 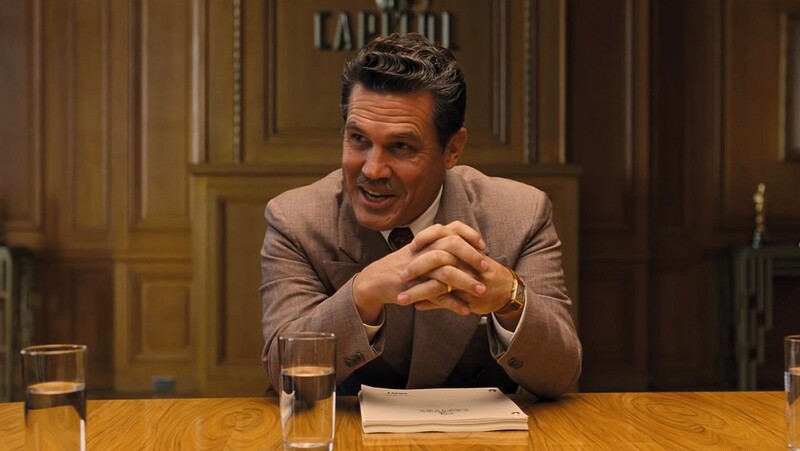 Constantly having to shield stars’ personal images and thwart controversy (and court) in his day-to-day work at Capitol Pictures film studios, it is here he faces his biggest career obstacle when star actor Baird Whitlock (Clooney) – who is in the midst of performing the lead role in the studio’s key production Hail, Caesar! – is abducted; with a $100,000 ransom. Lighting the blue touch paper to a series of absurd events, the comedy transcends the rest of the cast through a collection of farcical film set takes and slapstick musical montages. Along with the patriarchal mentality that Mannix exerts in steering his actors clear from mischievous gossip columnists and journalists, one of the central and most intriguing aspects in the narrative is the underlying political subtext. Peeling back the curtain on the shinning decade of Hollywood and revealing the creative censorship and expulsion that was prevalent in the country’s flagship creative industry, a break from the wise guy quips is facilitated through the film’s communist circle of disgruntled and repressed writers. Made up of blacklisted authors, screenwriters and academics, discussing their grievances with the entertainment business, one complains, ‘they take our ideas, and they’re the ones that dish out the money’ – indicating the stripping of intellectual property that was ceased upon behind the high-walled film studios of L.A. Playing out in 106mins, at times the plot seems too harried and slap-dash. Perhaps reflecting the quick paced, capture-and-cut work of the Hollywood industry at its zenith of decadence, however the talented cast seems too lost amongst the chaotic narrative structure. As for the comedy, the essence is in the duality of the themes, between the garish mass production, and the underlying culture of censorship – marking the Coens’ latest effort as more of a wry satire. As for the costume designs and set production, the picture captures perfectly the feel of 50s America and the hedonism and ostentatiousness of the Hollywood scene. Set at the height of the communist domestic conspiracy – dubbed the ‘red scare’ – the political subtexts uproot old themes of Cold War espionage and East vs. West binaries. However, the more innate stories of the proactive purging of creatives, from the literary world to the national film industry, reflect more unsettling goings-on. Relative to today’s intelligence and surveillance ubiquity, the stigma of McCarthy era blacklisting has been presented in the latest release Trumbo, and was the central subject matter in the 1977 film The Front (highly recommend), starring Woody Allen and screened at the GFT earlier this month. This dark, subversive aspect of the industry is exemplified when the fickle and mildly neurotic Mannix demands the uneasy Whitlock to play the final scene of the titular Hail, Caesar!, exclaiming: ‘The picture has worth…and you have worth because the picture does’. Balancing the defining epoch of the Hollywood machine with tongue in cheek derision alongside such serious political themes that still divide opinion in the U.S. today, Hail, Caesar! bills as a comically dry feature of distinct Coen brothers’ style, upholding itself as a serious period drama and worth a double take.